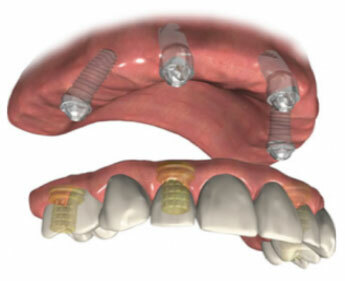 How is a Dental Implant Placed? How can a Dental Implant be Used? We can help you achieve same day teeth through all on four dental implants. The principle behind all on four means that you can choose to have the implant procedure and the very same day you will leave the surgery with teeth. You might question how it’s possible to get teeth in a day when the implants need to be left to heal and osseointergrate, but this is a ‘screw retained’ temporary Hybrid Acrylic Bridge that is loaded onto the implants and it is designed in such a way that the teeth don’t exert external pressure on the implants. This allows you to have a ‘fixed’ temporary for the healing period. If you decide to go for the “All on Four” option with a ‘fixed’ temporary, this is a little extra on top of the cost of “All on Four” with a non-fixed temporary. Our main priority is to give you what you want and deserve with our expertise and guidance. We use the latest digital and diagnostic tools in our state of the art surgeries to give you fantastic results. If you are a little nervous, we are here for you and all our staff are specially trained to look after you. At Gentle Dental Care, we offer dental implants from £1295. This means we are offering them for a price that competes with those only previously offered by European countries.